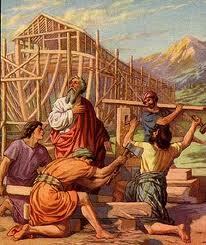 I was recently cajoled, bamboozled, shanghaied, flattered into leading two Sunday morning studies of the Noah story. Not that I know much about the Old Testament, but my bamboozler presented as the ultimate argument: “We know you can tell stories.” Actually, I’m glad I agreed. I found out a lot. Like anyone who ever brushed past Joseph Campbell, I knew, or rather suspected that many cultures have flood myths. Why not? These are dramatic, often terrifyingly sudden events, surely acts of an angry or inscrutable god, sparing some, destroying many. The mind screams “Why?” Then the sun comes out. The rainbow. The earth takes back her water. But I had no idea, none, zilch of just how many cultures have a flood myth. With a slight bit of sleuthing, I came upon The Talk Origins Archive and quite literally, OMG. Here they are, divided by continents. I didn’t know there there this many cultures. Check out the list. Is it complete? Texas actual estate trend as you search. Hi,I log on to your blog named “Everywhere a flood myth |” regularly.Your writing style is witty, keep it up! And you can look our website about proxy list http://proxylistdaily4you.blogspot.com/.